Thirukkavalampadi or Gopalakrishna Perumal Temple is located in Thirunangur in the South Indian state of Tamil Nadu, is dedicated to the Hindu god Vishnu. Constructed in the Dravidian style of architecture, the temple is glorified in the Divya Prabandha, the early medieval Tamil canon of the Azhwar saints from the 6th–9th centuries AD. It is one of the 108 Divyadesam dedicated to Vishnu, who is worshipped as Gopalakrishnan and his consorts Lakshmi as Rukmini and Sathyabama. It is one among the eleven divyadesams of Thirunangur Tirupathis and is closely associated with Thirumangai Alvar. The temple is open from 8 a.m. to 10 a.m. and 5 p.m. to 7 p.m and has four daily rituals at various times of the day. The Thirumangai Azhwar Mangalasasana Utsavam celebrated annually during the Tamil month of Thai is the major festival of the temple during which the festival images of the eleven Thirunangur Tirupathis are brought on mount designed like Garuda, called Garuda Vahana, to Thirunangur. The legend of all the eleven temples of Thirunangur are closely associated with each other. As per legend, the Hindu god Shiva started dancing in fury at this place after the death of his consort Uma due to the yagna (sacrifice) of Daksha. Each time his lock of hair touched the ground, there were eleven other forms of Shiva who appeared. The celestial deities were worried that if the dance continues, it would result in decimation of entire creations. They prayed to Vishnu for help, who appeared at this place. On seeing Vishnu, Shiva's anger was reduced and he requested Vishnu to appear in eleven forms like he did. On his request, Vishnu appeared in eleven different forms at Tirunangur. The eleven places where Vishnu appeared are believed to be where the eleven temples in Tirunangur are located. As per another legend, Krishna, the eighth incarnation of Vishnu and his consort Sathya Bhama chose this location for their garden as it was looking like the one in the palace of the king of celestial deities, Indra. Kavalam indicates elephant and padi indicates place - it is believed that Krishna saved an elephant at this place leading to the name of the temple. The event is described in the verses of Tirumangai Azhwar in Nalayira Divya Prabandham. 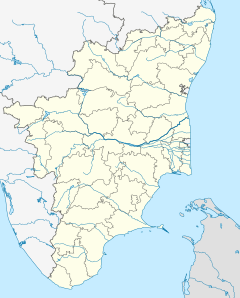 It is located in Thirunangur, a small village, 10 km away from Sirkali, on the way to Thiruvenkadu. The temple has a small shrine with Vimanam. The shrine houses the granite image of Gopalakrishna and his consorts Rukmini and Sathya Bhama on either sides. Gopalakrishna is sported in standing posture with his consorts Rukmini and Sathyabama. The name of the consort in a separate shrine is Madavaragal Mangai and Sengamala Nachiar. The temple is open from 8 a.m. to 10 a.m. and 5 p.m. to 7 p.m. The temple priests perform the pooja (rituals) during festivals and on a daily basis. The temple belongs to Thenkalai sect of Vaishnavism. As at other Vishnu temples of Tamil Nadu, the priests belong to the Vaishnavaite community, a Brahmin sub-caste. The temple rituals are performed four times a day: Ushathkalam at 8 a.m., Kalasanthi at 10:00 a.m., Sayarakshai at 5:00 p.m. and Ardha Jamam at 7:00 p.m. Each ritual has three steps: alangaram (decoration), neivethanam (food offering) and deepa aradanai (waving of lamps) for both Gopalakrishna, Rukmini and Sathyabama. During the worship, religious instructions in the Vedas (sacred text) are recited by priests, and worshippers prostrate themselves in front of the temple mast. There are weekly, monthly and fortnightly rituals performed in the temple. During the new moon day of the Tamil month Thai, the festival deity of Thirumangai Azhwar is brought to the temple from Thiruvali-Thirunagari. The Thirumangai Azhwar Mangalasasana Utsavam is celebrated in the Tamil month of Thai (January–February). The highlight of the festival is Garudasevai, an event in which the festival images of the eleven Thirunangur Tirupathis are brought on mount designed like Garuda, called Garuda Vahana, to Thirunangur. The festive image of Thirumangai Azhwar is also brought on a Hamsa Vahanam (palanquin) and his paasurams (verses) dedicated to each of these eleven temples are recited during the occasion. The festival images of Thirumangai Alvar and his consort Kumudavalli Naachiyar are taken in a palanquin to each of the eleven temples. The verses dedicated to each of the eleven temples are chanted in the respective shrines. This is one of the most important festivals in the region which draws thousands of visitors. ^ Anantharaman, Ambujam (2006). Temples of South India. East West Books (Madras). pp. 65–67. ISBN 978-81-88661-42-8. ^ a b S., Prabhu (12 July 2012). "Shrine dedicated to Arjuna". The Hindu. Retrieved 2013-09-09. ^ "Garuda Sevai" (PDF). Ramanuja.org. Retrieved 2011-08-19. R., Dr. Vijayalakshmy (2001). An introduction to religion and Philosophy - Tévarám and Tivviyappirapantam (1st ed.). Chennai: International Institute of Tamil Studies. T., Padmaja (2002). Temples of Kr̥ṣṇa in South India: history, art, and traditions in Tamilnāḍu. New Delhi: Shakti Malik. ISBN 81-7017-398-1. Wikimedia Commons has media related to Thirukkavalampadi. This page was last edited on 26 March 2019, at 16:35 (UTC).